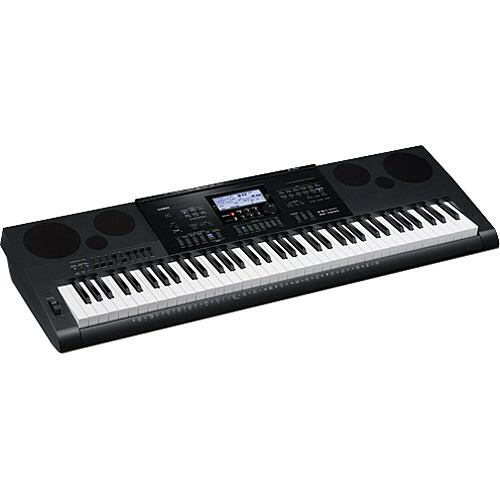 The WK-7600 from Casio is a 76-key workstation keyboard that not only provides over eight hundred tones organized by category, but also features a seventeen track sequencer, a thirty-two channel mixer, DSP effects, and USB MIDI connectivity. Each of the voices can be edited with control over filters, envelopes and more and audio can be recorded to SDHC cards with everything played back via built-in amplifier and speakers. The comprehensive range of tones includes dynamic stereo pianos, vintage electric pianos, strings, drums and a wealth of synthesizers and acoustic instruments. Nine front panel sliders provide control over fifty organ tones. The sliders can control the level of each harmonic overtone to produce a rich organ sound and rotary speaker effects and percussion control are all instantly accessible. Deeper editing allows for changing the key click, overdrive, rotary speeds and more. A total of 260 preset rhythms are available with full accompaniment built-in. One button click brings access to styles from rock, pop, Latin, jazz, country, classical and everything in between. There is a choice of just a drummer or a full virtual band. The sequencer allows for editing performances and turning out professional sounding tracks. The resulting song file can be saved to an SDHC card or saved as an audio recording. The mixer utilizes the sliders to provide additional control over the final output. Box Dimensions (LxWxH) 50.0 x 19.0 x 7.5"
WK-7600 - Workstation Keyboard with Sequencer and Mixer is rated 5.0 out of 5 by 3. Rated 5 out of 5 by Pete from love the draw bar organ tones After much research I concluded that the WK-7600 would meet my needs. the sound quality of the stereo Grand sounds good. The keyboard touch is ok and the volume is extremely strong and of great quality. for only $. I have found nothing to dislike about this keyboard this keyboard is used for our tent Revival services, and practiceing at home I like that The keyboard is very lightweight and can be taken anywhere very easily. love the draw bar organ tones all this for a great price!!! Rated 5 out of 5 by Earl the Pianoman from EXCELLENT, you won't be disappointed. Already owned the WK-7500 bought this as a backup. I play professionally and use this keyboard now 2-3 times a week. The WK-7600 is superior. Casio did a great job changing the touch and quieting the keyboard on the WK-7600. The few additional instruments are a nice touch. The microphone volume control is also a good upgrade although it is not too convenient to reach while playing. I use the built in speakers as my monitor although I play through a PA. The reverb and other effects are great and that is all I use for singing. I primarily use the Grand Piano instrument. For the less than $500 price this keyboard can't be beat. I hope Casio upgrades again in a year or two and starts adding some of their new features like the color screen from more expensive models like the CGP-700 to their workstations. You won't be disappointed at all with the WK-7600 if you buy it. Rated 5 out of 5 by Anonymous from GREAT SOUND!! full of features that would be unheard of years ago, user friendly, multiple sounds, can use microphone with the build in amplifier, great price!!! Does it take a standard or universal sustain pedal? It will take many brands of sustain pedal. The one that seems to be the best one for the Casio WK-7600 is the M-Audio SP-2 Universal Keyboard Sustain Pedal. We have it at B&amp;H and the part number is B&amp;H # MASP2. I have attached a photo of the pedal for you.